We're excited to share the news that December 2, 2014’s #GivingTuesday donation volume through FrontStream’s non-profit clients increased by an impressive 30% over Dec 3, 2013! FrontStream recorded donation data through FirstGiving.com, the Artez enterprise fundraising system, and our API partners like IndieGoGo.com. Each year that charities and non-profit organizations participate in #GivingTuesday is another excellent opportunity to learn more about online donors. We’ve sorted through the big numbers to bring you this year’s most useful insights. 1. “Mobile users” are now the norm! In the United States, crowdfunding and peer-to-peer platforms have seen a record rise in the number of visitors on mobile devices. 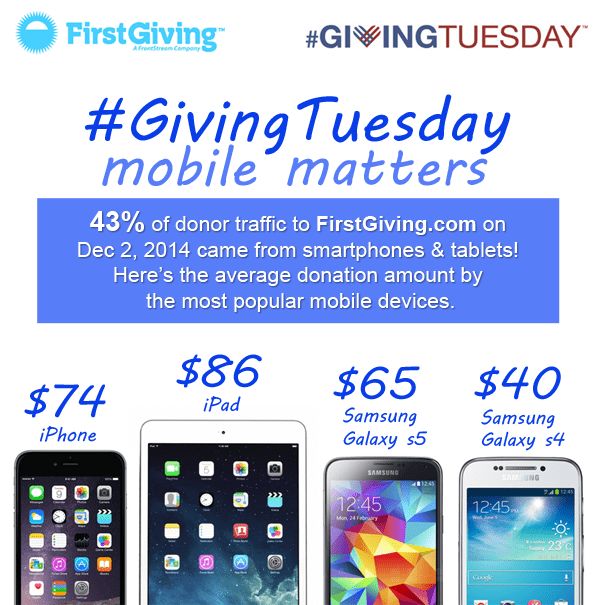 An incredible 43% of people browsing donation forms through FirstGiving.com on #GivingTuesday were on smartphones and tablets! And in Canada, 28% of people browsing charity web pages through the Artez enterprise fundraising system on #GivingTuesday were doing so on mobile devices. Recent Black Friday reports have noted that the average purchase amounts are higher for iOS users than Android users. We saw the same trend when we examined the average online donation size by mobile device. The average donation on the FirstGiving.com platform was $79. Desktop/PC users donate in the morning, mobile users donate in the evening. Did you know that there’s a significant difference in donation traffic patterns when mobile users are compared to desktop users? We saw that pattern clearly represented on #GivingTuesday. The peak time for online donations through desktop computers and laptops was between 9am – 11am EST, while the peak time for online donations through smartphones and tablets was between 7pm – 9pm EST. This finding is consistent with what we already know about browsing on the mobile web. Smartphone and tablet usage tends to spike in the commuting and evening hours. What does this mean for your organization? Charities have two audiences: Your first audience is typically visiting your website and donation forms on the “big browser” while at work or at school. As the day goes on, your organization has a second opportunity to speak to the donors who will be reading your emails, or viewing your social media posts on mobile devices in their leisure hours. Try scheduling mobile-optimized emails or social content for a time period that can reach that “second audience”. 2. 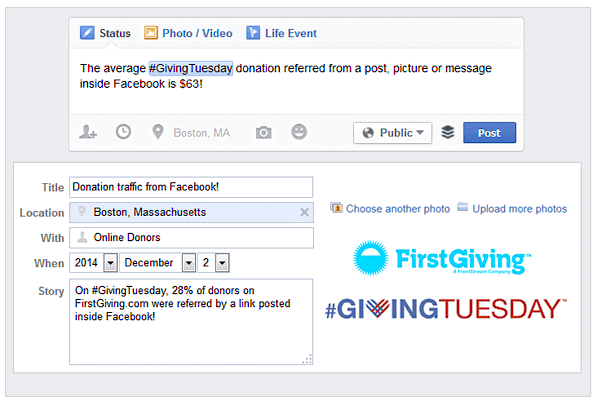 Facebook continues to be the social network of choice for #GivingTuesday action! While it appears that over half of #GivingTuesday traffic arrived at donation pages from online searches and email appeals sent by charities, the top single referring website by a wide margin was Facebook. At FirstGiving.com, an incredible 28% of donors clicked first on a post, message or comment containing a link inside Facebook before donating on #GivingTuesday. At the busiest period of online donation activity (9-11am), an astounding 34% of donors were coming from Facebook! Could this pattern correspond to the number of individuals checking in with their social networks when they begin work or school? Social donations are typically smaller than direct donations, but they’re certainly not insignificant. This year, the average donation referred from Facebook was $63! How did other social networks perform on #GivingTuesday? While platforms like Twitter, Instagram, and LinkedIn play an important role in spreading the giving message, they don’t appear to drive donations as well as Facebook does. Only 1.2% of online donations were referred by Twitter, the second most effective social network after Facebook. What does this mean for your organization? Facebook is the most popular commercial social network with your donors. More than half of Facebook’s users log in every single day! This means your supporters are more likely to see and share your content on Facebook than on other social platforms. While activities on other networks are always part of a well-rounded content strategy, it’s important to think about how you can share your cause where your supporters are most likely to engage with it … On Facebook! 3. Charities are better than ever before at converting visitors to online donors. #GivingTuesday 2014 had higher online conversion rates than #GivingTuesday 2013. Supporters who clicked on a #GivingTuesday 2014 call-to-action and arrived on a charity’s donation page were 13% more likely to convert to an online donation this year. This positive metric indicates non-profit organizations have streamlined and improved their appeals for support! The most improved channel for converting donors to online donation was Facebook. The conversion rate for Facebook was 6% in 2013, but jumped to 12% in 2014. What does this mean for your organization? As they say in marketing: “Test, test, and test again!” What kinds of content, subject lines, images, posts or tweets were most effective for you on #GivingTuesday? The answer could give you valuable insights into the type of messaging that might appeal to your supporters during the busy holiday donation period in the last three days of the year.